This page features photos of the Borgsmiller family. Click on any picture for a larger image. This is a photo of the original Borgsmiller family of Murphysboro, IL. If your last name is Borgsmiller, these are your ancestors. 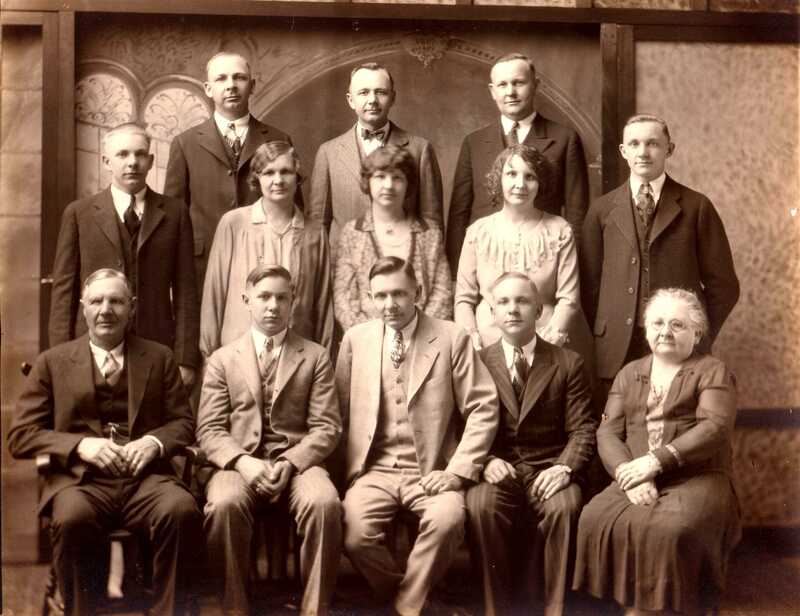 Henry Borgsmiller, Sr. is in the lower left corner, and his wife Elizabeth is in the lower right. The others in the picture are their three daughters and eight sons. The top row is, from left to right, William, Henry Jr., and Joseph. The middle row is Theodore, Gertrude, Clara, Elizabeth, and John. The sons in the bottom row are Charles, Herman, and Frederick. I don't know when this was photograph was taken, but from the ages of the children I would guess that this was taken during the 1920s. This page was last updated on 12/23/03.